or if you prefer send us a message filling the contact form. Elegance and glamour for a unique bedroom! Bedroom with curved headboard with upholstery. handmade upholstered in synthetic silk BENGAL MAQUILLAJE (CHECK OUR FINISHES PDF!) . CHECK OUR PDF FINISHES WHERE YOU CAN CHOOSE BETWEEN A WIDE RANGE OF FABRICS, FAUX LEATHER AND FINISHES WITHOUT SUPPLEMENT OF PRICE. Lacquered bedside tables with 2 drawers and baseboard. THE HANDLES CAN BE IN HIGH GLOSS GOLD OR SILVER FINISH !!! Please indicate your choice when ordering. Made of MDF fiber wood FIBRALAC specially designed to achieve the best finish possible when performing the process of lacquer, solid beech wood and oak wood dyed in open pore. Interior of drawers in textile design and partial extraction with metallic runners and soft closing. 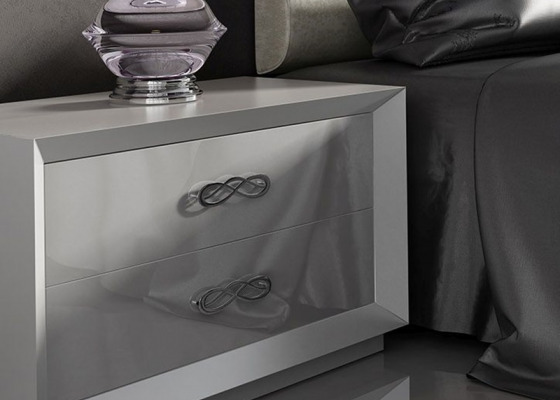 High quality finish with a wide range of colors in oak veneer and ACRYLIC lacquers of the highest quality. 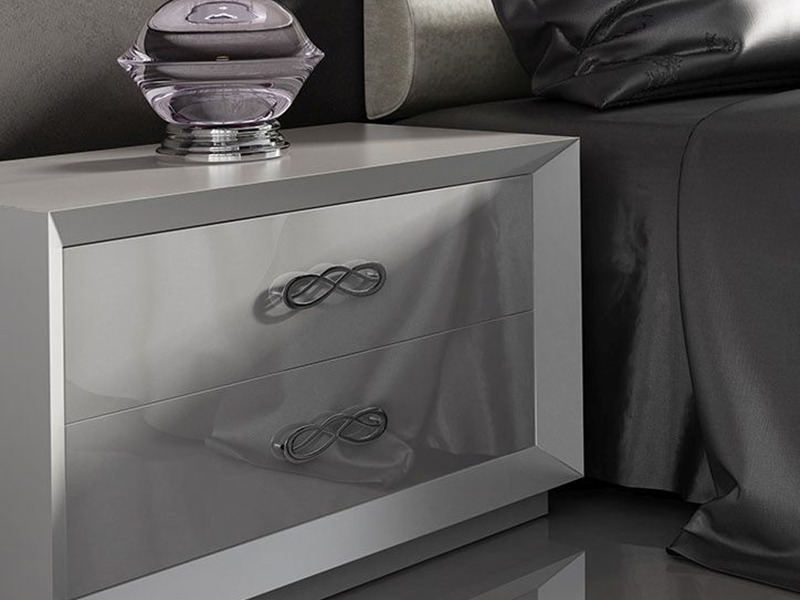 ACRYLIC lacquer brings a higher quality to the finish and a more natural and uniform shine. Check out our PDF of finishes. Finishes picture: WHITE LACQUER 120 HIGH GLOSS. HEADBOARD TO HANG ON THE WALL, FOR 160 CM MATTRESS: 170x10x110 h. cm. HEADBOARD TO HANG ON THE WALL, FOR 135 CM MATTRESS: 147x10x110 h. cm. HEADBOARD TO HANG ON THE WALL, FOR 150 CM MATTRESS: 162x10x110 h. cm. 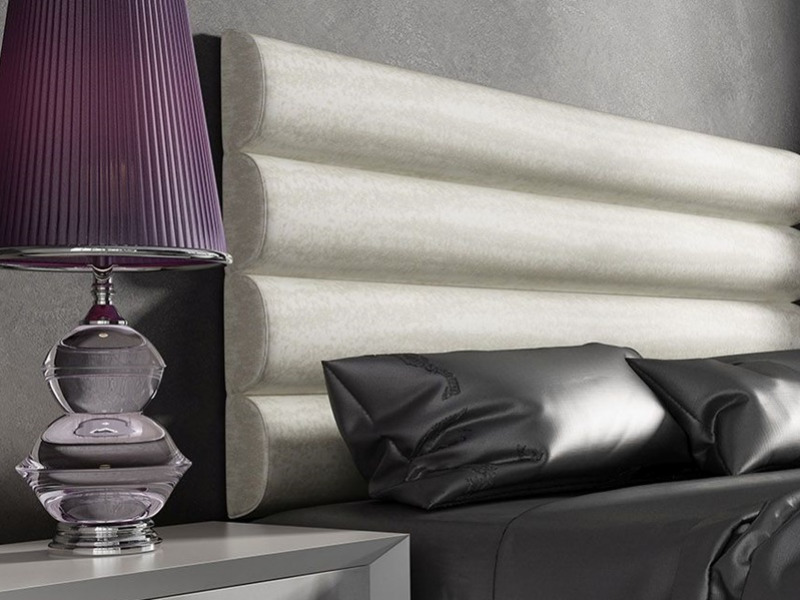 HEADBOARD TO HANG ON THE WALL, FOR 180 CM MATTRESS: 193x10x110 h. cm. HEADBOARD TO HANG ON THE WALL, FOR 190 CM MATTRESS: 203x10x110 h. cm. HEADBOARD TO HANG ON THE WALL HEADBOARD WITH LEGS (UPHOLSTERED BACK REAR) TOTAL HEIGHT: 140 CM. 60x40x44 h. cm. 70x40x44 h. cm. Subscribe to our mailing list and get the latest news and deals from Luxury Loft! © 2019 Luxury Loft. All rights reserved. +34 960 046 805 - SKYPE: Luxuryloft Decoración, S.L. We use our own cookies and third party cookies to improve our services by analyzing your browsing habits and preferences. If you continue browsing, we understand that you accept its use. More information.